If you knew that there were tens of thousands of street dogs roaming a jurisdiction in the United States and a 95 percent euthanasia rate for the dogs and cats entering the shelters in the area, what would you do? Well, that is the reality in the Commonwealth of Puerto Rico, which is part of the United States and a huge trouble spot for animal welfare. And now, we have a plan to attack the problem. 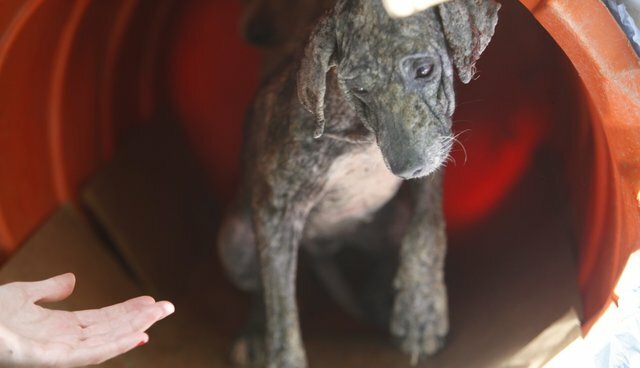 This week, in an extraordinary series of events - including press conferences, shelter visits, and training programs - The HSUS and the government of Puerto Rico said "no more" to neglect and cruelty. We have launched a Humane Puerto Rico initiative that offers the prospect of turning around decades of problems for animals in this commonwealth of the United States. "Our children see how we treat these beings. They can learn to love and care for them or to mistreat them," César A. Miranda Rodríguez, Puerto Rico's Secretary of Justice, told assembled police trainees, reporters, and government representatives at a press conference on Apr. 15 with Secretary of State David Bernier and me. "So if we want a better society tomorrow, we need to build it today." At the press conference, we announced an initiative on the island to train hundreds of prosecutors and law enforcement personnel on animal cruelty crimes, a crackdown on puppy mills, a humane education program that we'd lead to reach every K-12 public school student, and new technology and tools for shelters across the island. The HSUS is donating evidence-gathering kits to law enforcement, and this week trained more than 800 prosecutors, law enforcement personnel, animal control workers, and shelter leaders. Our global affiliate, Humane Society International, will be helping with its already initiated low-cost spay-and-neuter programs. A highlight of the press conference was the announcement of Executive Order 2015-8, signed by Gov. Alejandro Garcia Padilla, memorializing many of the terms of the agreement and pledging cooperation from the government to crack down on animal cruelty and to address the street dog and euthanasia problems. The HSUS will invest $600,000 initially in these programs, and I expect that will just be the start of our investment in the island. In traveling to Puerto Rico this week, I was struck by the incredible enthusiasm for this program. The people of Puerto Rico want to do better when it comes to animals, and there are so many caring people there. With the resolve of the government and the resources and training programs of The HSUS, I see a pathway for a far brighter future for animals in the commonwealth, which is about three times the size of the state of Rhode Island, has nearly four million people, and is estimated to have 300,000 street dogs and one million cats, according to local officials. We are also tremendously excited about meetings with the leadership of the Puerto Rico Veterinary Medical Association and the Puerto Rico Tourism Company. The tourism industry has received countless letters from pained visitors who've felt helpless in seeing injured or mange-covered street dogs. These experiences have taken a toll on visitation to the islands, and everyone acknowledges it's in the economic interest of the island to get control of the problem and deliver better outcomes for animals. Indeed, the seeds of the program were sown when HSUS hired its first-ever Puerto Rico director, Yolanda Alvarez, after a generous HSUS member visited Puerto Rico and was deeply troubled by what he saw. He donated tens of thousands of dollars to allow us to hire Yolanda. Yolanda then partnered with Tara Loller, our puppy mill policy implementation director, and they worked with Attorney General Miranda to build the elements of the program. In my many years of humane work, I've never seen so many strands pulled together at one time, with every agency and private player contributing to a comprehensive plan to turn around the problems that have plagued the animals and the people of a state or a community. The HSUS will be in Puerto Rico for the long haul, and if this week's launch was an indicator of the quality of the program, change is coming in a dramatic way.